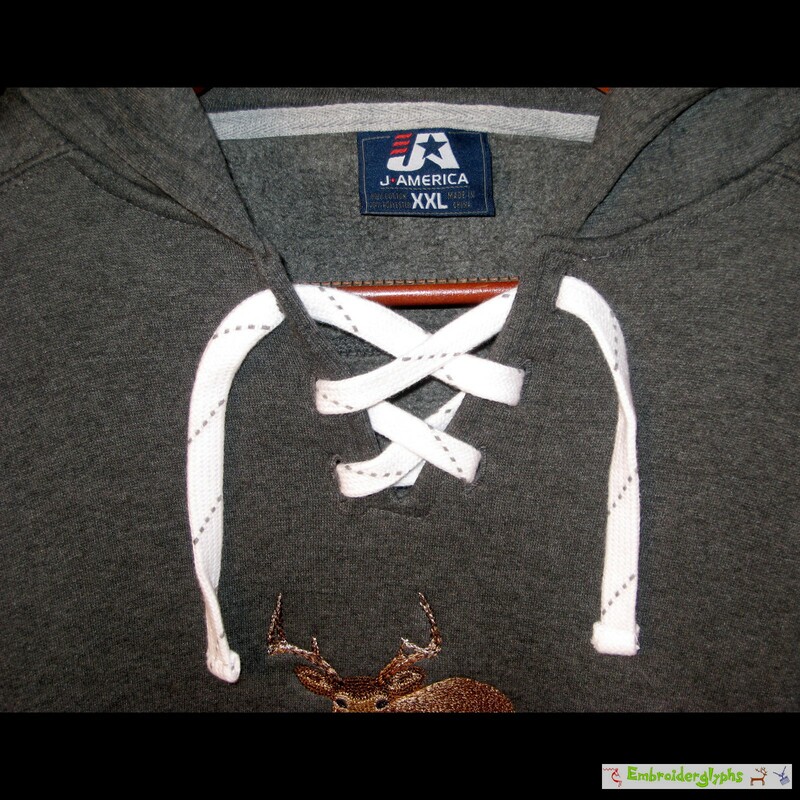 Price: $42.00 USD This item is sold, however you can place an order for this design on other sweatshirts. Pick your color, size, even with or without a hood. Medium Gray — other colors available. Men's size: XXL — other sizes available. The design is of a white-tailed deer — a very large buck. 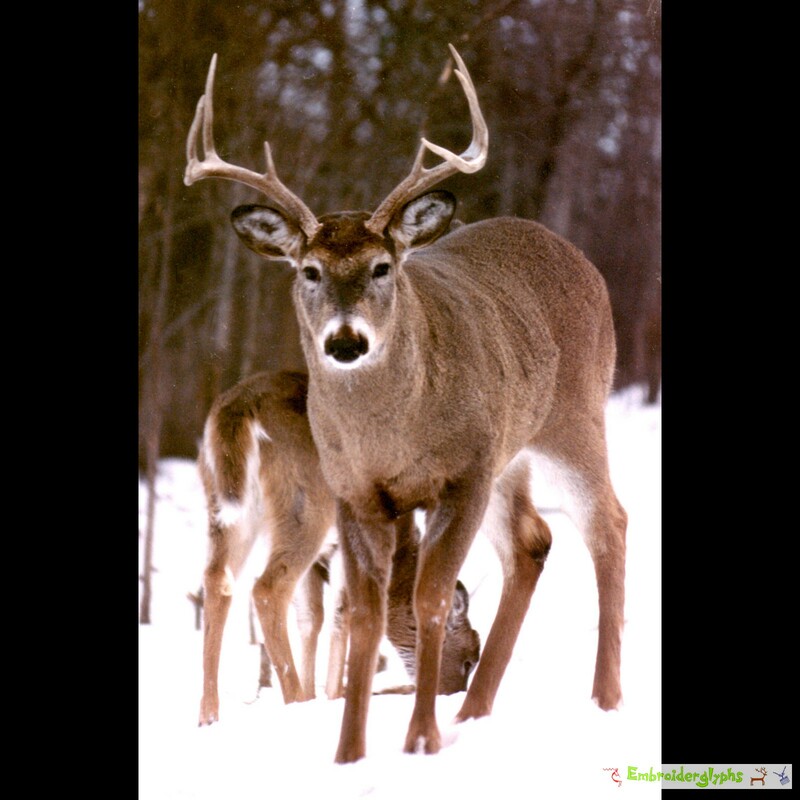 It is an impressive buck — and the digitized reproduction is equally impressive. This design is very eye-catching and gets lots of praise when worn in public. 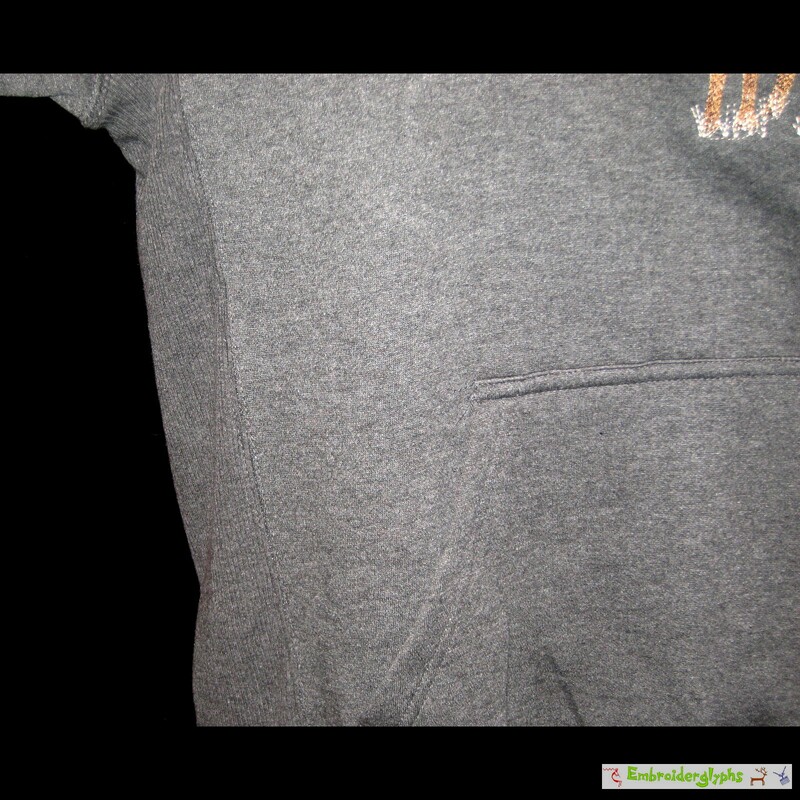 (John's favorite sweatshirt is identical to this one, but on a black sweatshirt.) The original photo that this design is based upon is from a famous outdoor writer and photographer, Dr. Ken Nordberg, (used with his written copyright permission). John digitized the design. In order for you to see the quality of the design, Dr. Nordberg's original copyrighted photo is shown as the fifth image. This design has a high stitch count — it has a very dense, tactile feel. This is a sweatshirt embroidered by Beth at Embroiderglyphs. Notice the ribbing in the underarm panels — this shows an extra level of quality. The pocket in front is great for holding an iPod, mp3 player, or cell phone when you go on walks. This sweatshirt would be perfect to help keep you warm when you are out and about at home, at the cabin, on a camping, a canoe trip, or on a hike! Do you know someone with a birthday soon? This would be a great gift idea. people from sates where there are a lot of deer. Christmas is coming up. This would be a perfect gift for the deer hunter on your list. 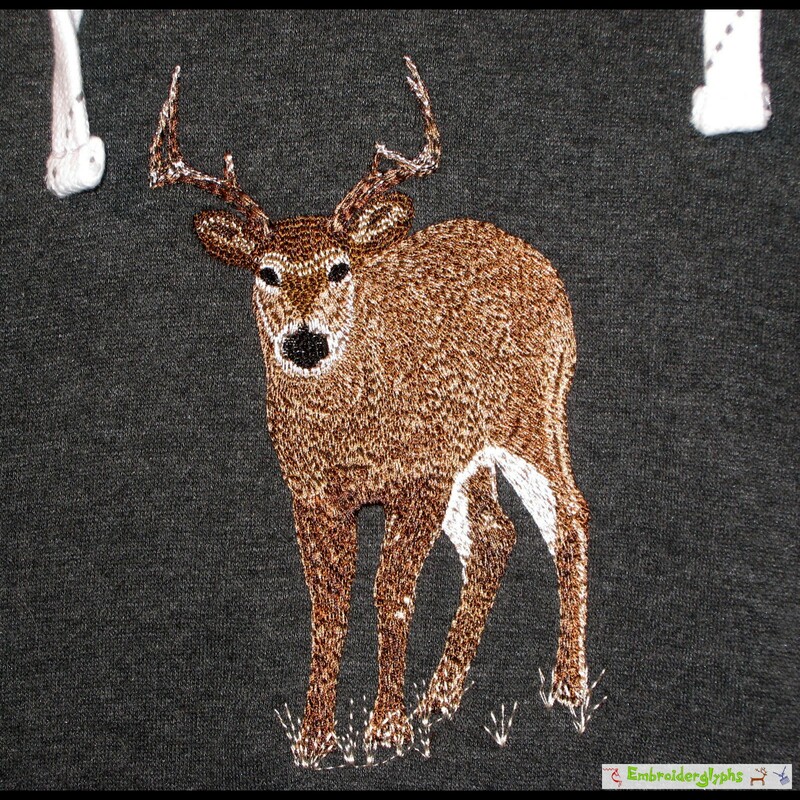 If you would like this impressive buck embroidered on another color and/or size, please request a custom order (it will be the same price). Size XXL — other sizes available. Link to this item on Etsy. Link to this item on Ebay. XXL — other sizes available. We are a small embroidery shop. Because we can get just about any kind of sweatshirt from our suppliers in 1–2 days we don't stock a large variety of brands, sizes, colors, of hooded and hoodless sweatshirts. Please, if you would like this design on a different sweatshirt, just contact us. This design is great for: men's aprons, totes, bags, pillows and sweatshirts. 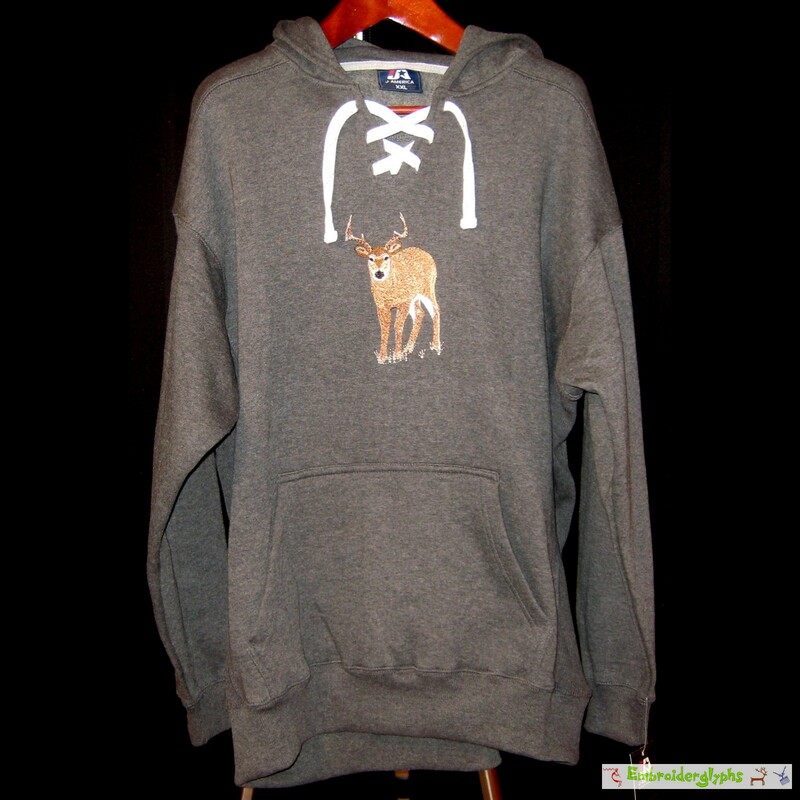 Sweatshirt, grey, deer, white-tailed deer, buck, big buck, trophy-class buck, embroidered, Dr. Ken Nordberg, XXL, size, price, pocket, hood, hoodie, hoodless, no hood, realistic, hunter, deer hunter, cabin, hike, walk, outdoors, Minnesota, fall, B.W.C.A., canoe trip, camping, birthday present, Christmas present, Father's Day present.